“Strong performance in August driven by increases in attendance (+5%), guest spending (+1%) and out-of-park revenues (+7%). Company reiterates its commitment to 4% distribution growth. 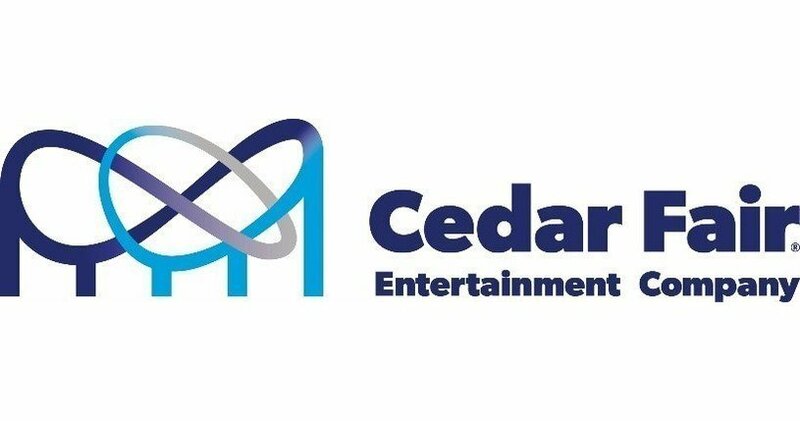 Cedar Fair… announced that preliminary results for the five weeks ended Monday, September 3, 2018, represented record revenues for the fiscal month of August. That early September press release, and the more recent press release, both included 2018 full year Adjusted EBITDA guidance of $460-$470 million. The guidance falls short of the company’s initial long term target of $500 million used in a presentation made in early 2015. The 2015 presentation (see below) was important for several reasons. First, note the minimal growth from $425 million in 2013 to $431 million in 2014. The $431 million fell short of the company’s annual guidance for 2014, and it was the last time the company issued annual guidance. The CEO at the time, Matt Ouimet, instead issued the above long term Adjusted EBITDA target of “$500 million, or more, by 2018”. 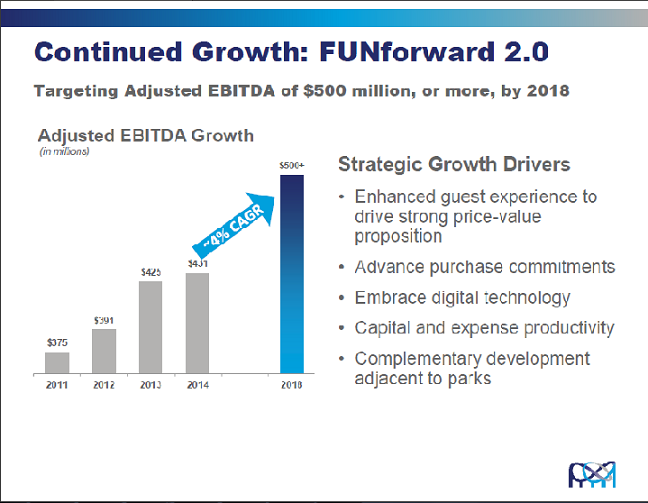 Second, note the expectation that Cedar Fair would grow its Adjusted EBITDA by a compounded annual growth rate (or CAGR) of ~4% through 2018. Third, it was that anticipated 4% growth rate that would also fund increases in the company’s annual distribution by ~4% – the “commitment” referred to by Meyer in the press releases and on the conference call. After a strong 2015, when the company generated $459 million, Cedar Fair revised that long term expectation, pulling the $500 million target forward. 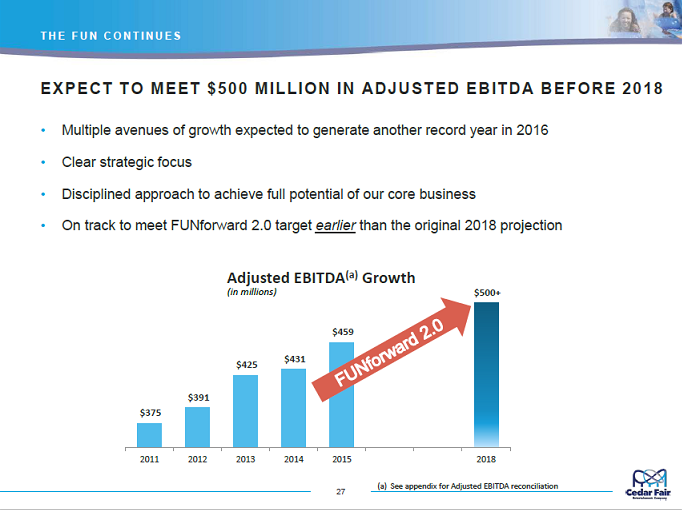 Note that the updated chart (below) stated “MEET $500 MILLION ADJUSTED EBITDA BEFORE 2018“. The company did not meet the $500 million target “earlier” than expected, nor will it meet it as originally expected. Now, investors can expect a second consecutive year (2017 and 2018) of declining EBITDA. The negative growth of Adjusted EBITDA over the past two years could be an indication that the 4% growth in the distribution may not be sustainable. And, if the distribution growth rate comes under pressure, this becomes much more of an income oriented investment yielding ~7%. And, that 7% could lose some of its luster as the Fed continues to raise interest rates. I can see some very modest upside in the unit price, but it may not even perform as well as the market, and the risk-reward keeps me from tagging this as a buy recommendation. Nor, due to that 7% yield, would I suggest anyone sell. For those that are seeking a bit more current income and are willing to add a bit of complexity, a simultaneous buy of the units and sale of a covered call can push the potential annual percentage yield into double digits. For those wondering about the term “Distribution” rather than Dividend, it should be noted that Cedar Fair is a Limited Partnership. As such, the quarterly payments are reported on a Form K1 and are treated differently at tax time. Cedar Fair has a long history of paying increasing distributions, and in fact had annual increases for decades until 2009. At that time the quarterly rate was slashed from $0.48 to $0.25. At the end of 2009 it stopped payments until a single $0.25 payment was made at the end of 2010. In 2011, it paid out a total of $1, with four payments of $0.08, $0.10, $0.12, and $0.70. 2012 saw Unit holders (Cedar Fair trades Units rather than shares) received $1.60 in four equal payments. 2013 saw the company make three payments of $0.625 and an increase in Q4 to $0.70. And, since 2013 has maintained a pattern of increases in Q4 of each subsequent year. These quarterly rates rose from $0.70 to $0.75, $0.825, $0.855, $0.89 and finally to the current rate of $0.925. Interestingly, the payouts and increases since 2010 have rewarded patient investors with total payments that would have exceeded the $0.02 per year increases that had become the norm prior to the distribution cut. And, lastly, based on the recent Unit Price of ~$52-$53, the increase has boosted the expected yield to more than 7%. Some may not want to be bothered with the extra paperwork involved with taxes or concerned about the fact that the distribution was slashed nearly ten years ago. Of more concern might be the growth of the distribution which is exceeding the growth in Adjusted EBITDA. Regardless, the current yield of 7% is reason enough for me to continue to hold. …what would have to happen either around attendance or EBITDA where you guys would have to cut that distribution. And I’m guessing after your announcement today you don’t see anything over the near-term that would concern you about current business environment that you’re operating in. The strength and resiliency in our business model in total, based on that confidence in our business model, based upon what we see in meaningful pickup in season pass sales heading into the 2019 year, we think we’ve got ability to generate the cash flow that will cover that 4% increase, which is our long-term target. And it’s that confidence in the business model by management and the Board that’s evidenced by our increase in the distribution today. So I want to circle back to the distribution, obviously you see here in terms of operating results haven’t exactly been where you would have hoped or expected. I think the guidance is maybe down two to 4% … but you’ve got a distribution growth target of 4%. [Hardiman] asked about sort of your comfort with keeping the distribution but I wanted to ask about staying on this path of the 4% growth. I guess given the first maybe walk us through sort of how you were able to bridge that gap between the EBITDA and the distribution increase this year and then as I look to 2019 and the potential increase toward 2020, what’s the range of outcomes in terms of EBITDA growth that you would feel comfortable with another 4% increase I guess put another way or have you sort of eaten up that buffer that you had whether it’s from tax deduction and taxes or whatever else that, we should expect the distribution to be sort of in line with EBITDA growth? … as far as mechanics go, what I would say is that, when we look back over the last six or seven years we’ve built the balance sheet with the flexibility to withstand these types of short-term disruptions and the EBITDA growth rate that you outlined for 2017 and 2018. There’s enough drive out on the balance sheet and that was put there intentionally not only to potentially activate incremental growth opportunities, potential M&A opportunities that may exist but also to [weather a] year like 2018. So we’re going to utilize that flexibility to support the distribution here in the near term. There’s no doubt that we have to get back to that EBITDA growing just to sustain the distribution growth. I think Richard’s comments earlier about our confidence and not only the way that 2018 season has event, but the advanced sales and a bit of a long lead indicator we have for 2019. We and the board feel very good about the outlook for the company and the growth in front of us. And so I think that’s the rationale and the thought process that went behind the distribution increase. As it relates to guidance or whatnot, we’re not going to get into giving guidance for ’19 or ’20 or beyond, but know that there definitely has to be growth in EBITDA as you articulated to sustain this kind of growth in the distribution going forward. Incremental payments for Fast Lane and the newer Fast Lane Plus which allow visitors to go to the head of the line on some of the company’s most popular rides. A variety of pre-paid single day or all-season dining plans. Separate drink plans that allow unlimited refills. Heavy promotion of Season Passes, Group Plans and Advance Parking. In-season special events. Out of Season special events such as Winterfest, which will be introduced at three new parks this year and one more next year. Expanded hotel and camp-site accommodations. Sports Centers. The problem? Despite the introduction of some of these programs, there will be a second consecutive year of declining Adjusted EBITDA. Part of this has been attributed to poor weather during key portions of the season. With the introduction of Winterfest, the weather is likely to introduce more uncertainty and variability in attendance. …as it relates to the wage inflation, I would tell you in terms of the pressures around rate, our average rate has remained up in the high single digits most of the season, 8%, 9% increase in average wage rate. The teams, I have to give credit to the operating teams. The general managers and their teams, Tim Fisher, our COO, have done an outstanding job of managing hours throughout the season where appropriate, taking hours out of the system, when attendance isn’t there, without sacrificing the guest experience. One of the things that we’ve paid close attention to and we alluded to in the prepared remarks is net promoter score ratings have remained at the highest levels in quite some time. So the teams have done a very good job. We’ve managed more than 350,000 hours out of the system over prior year. And so we’re doing an outstanding job of taking hours out. But wage rates continue to be up year-over-year, and that’s been the case throughout the season. …as we look towards ’19 there’s again going to be some pressure in statutory increases in some of the markets we operate in that was similar to ’18. We were very aggressive in taking up some market adjustments heading into ’18 in order to be more competitive in our markets and attract a higher quality of employee. And I think that has played out throughout the season as evidenced by the higher net promoter scores, et cetera. I think we are getting better employees. I think some of those moves on the market adjustments are going to work in our favor into ’19, where I don’t anticipate us having to make as many adjustments in that area. That said, we probably won’t have the ability to take out as many hours. And so I would expect that the overall pressure on seasonal labor costs when you push hours and rate together will probably be something in those mid-single digits, like they were in ’17 and ’18. Cedar Point has been able to steadily increase its distribution the past several years despite its recent declines in Adjusted EBITDA. And, investors were reassured by Witherow and Zimmerman that the distribution was currently adequately funded. Whether or not that continues to be the case will need to be monitored. Cedar Fair is not the right investment for everyone. The Adjusted EBITDA has been moving in the wrong direction the past two years, and since 2014 has only managed to grow at half the rate expected by the company. There are also some complications of owning a Limited Partnership at tax time that will present additional challenges, challenges that may be magnified if the Units are placed in an IRA or other tax-advantaged account. On the other hand, the current Unit price is in the low $50’s, nearly one-third lower than its high in the low $70’s reached in the first half of 2017. As a result, the $3.70 annual distribution currently produces a generous yield of more than 7%. Think of that yield as the market telling you that there’s a risk premium built into the price. On the other hand, it’s an attractive enough yield for this investor. I will continue to maintain my position and monitor future events carefully. Disclosure: I am/we are long FUN. Additional disclosure: I recently added to myFUN positions when the Unit price dipped to $48.58 in late October, I currently re-invest the distributions. OLDER POSTUniversal Studios Hollywood, the Entertainment Capital of L.A.